I can't say that laundry day is my favorite day of the week. I do enjoy the end result though. Bath towels still hot from the dryer, fresh scented pyjamas, and crisp sheets to snuggle into. Today, I bring you a few things to make the laundry-day experience just that little bit more enjoyable. Before you begin, always remember to sort your clothes properly. I think we have all lived through the heartbreak of turning a perfectly good load of white clothing into a baby pink nightmare with the overlooked addition of one errant red sock. 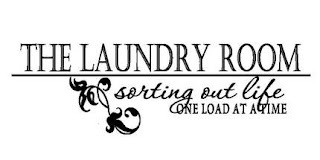 This wall decal from empressivedesigns, will bring a smile to any laundry room. 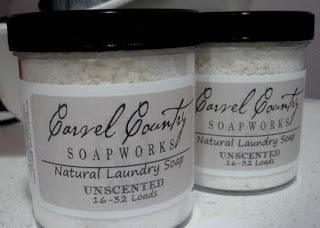 Next, for an eco-friendly washing alternative, try this natural laundry soap from carvelcountrysoaps. These small jars hold enough powder to clean up to 32 loads in a regular machine, and up to 64 loads in an HE washer. For a natural and eco-friendly alternative to dryer sheets, try these dryer balls. 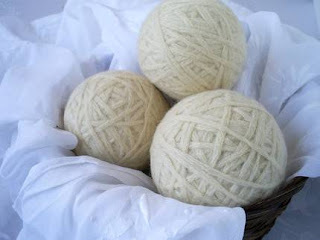 Etsy seller ElasIdea makes these woolen balls from re-purposed sweaters. By thumping around in your dryer, they naturally soften and fluff your fabrics. Their use also reduces overall drying time, which is good not only for your fabrics, but also your utility bills! Now, with spring on the way we can again look forward to the fresh scent of line-dried laundry. 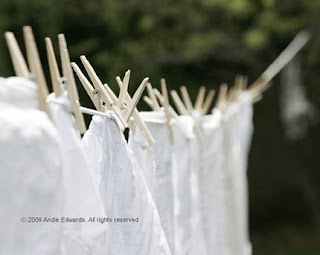 I can think of only a few things that smell more heavenly than laundry dried by sun and breeze. Here, is a taste of those warm sunny laundry days to come. This photo is from andieedwardsart. Ooopppsss.... that's the spin cycle done. I better get on with it.